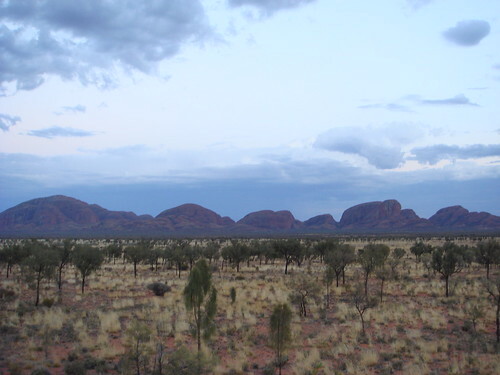 This is Kata Tjuta, 'the place of many heads', in Australia's central desert. It's tough to get any perspective about the scale of the rock domes. I'd guess the big square one down there is the size of a city block. The Valley of the Winds hike was probably the most physically exerting thing I've ever done. Even though the track is only 8 km, at 42˚C with a long, steep climb and the surrounding rock faces radiating intense heat, I was struggling to be sure. I think I'm the kind of person who would go insane if I spent too long in the desert. 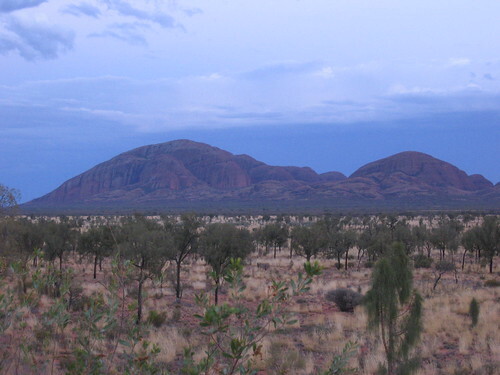 Kata Tjuta is part of the same rock stratum as Uluru, which is located 25 km to the east. 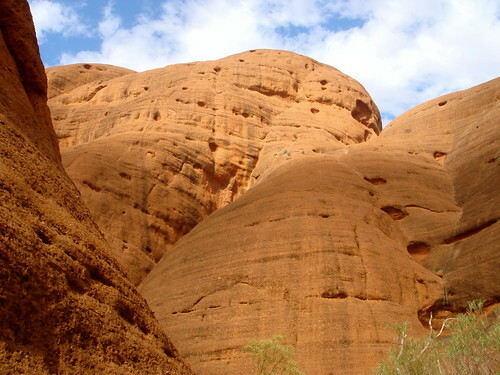 Despite being formed from a common layer, Uluru and Kata Tjuta's rusty red surfaces look very different up close. 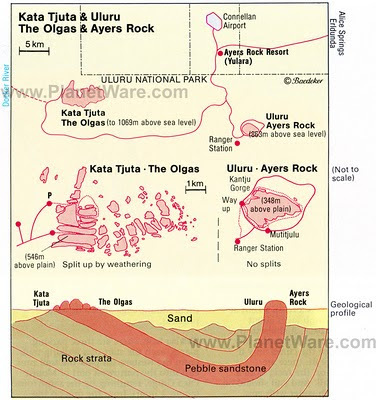 Uluru's rock is fine-grained and homogeneous while Kata Tjuta's stone is a mish-mash of pebbles and cobbles. If I remember my Earth Sciences correctly, this is related to 'sorting' and 'transport load' etc., meaning that the the two sites were located at different energy stages of a large alluvial fan. 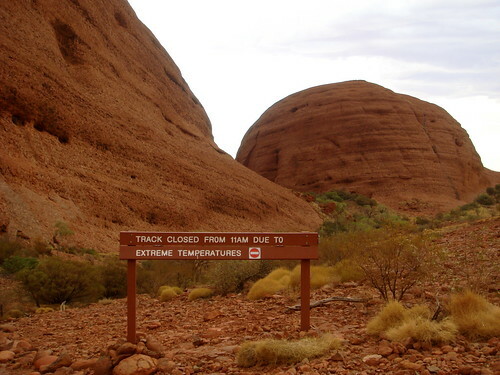 At Uluru, the water was calm: sand was gently deposited which eventually became sandstone. 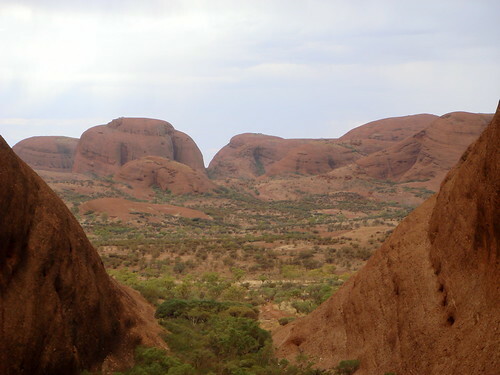 At Kata Tjuta, the water's flow must have been more powerful because larger pieces of detritus were carried along by the current. Over time, the deposited detritus hardened into a conglomerate sedimentary rock. 300 million years of weathering accounts for the rest. Now that I think about it, the confronting and utterly overwhelming reality of how much time has passed to create these rock shapes... that may be the most exhausting part of desert exploration. 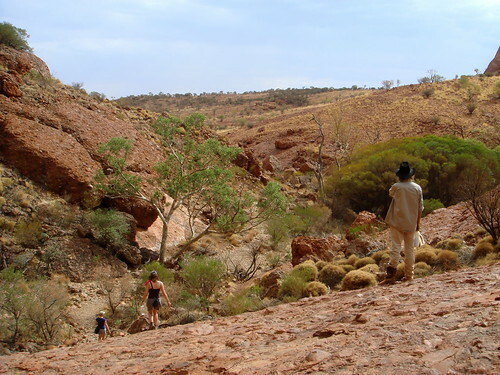 PS I traveled with Wayoutback Tours in a small group.